While the political agenda continues to be dominated by Brexit, the prospect of a ‘no-deal’ situation, and in-party backlashes and disagreements, industry, the business world and indeed the country awaits the outcome of talks with Brussels. Earlier in the year, on 26 June, the European Union (Withdrawal) Act 2018 received Royal Assent, making it law. It repeals the European Communities Act 1972 (ECA) on the day the United Kingdom leaves the European Union. 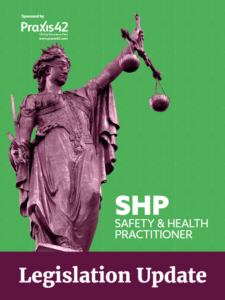 With much of the UK’s health and safety legislation deriving from EU policy, extricating UK health and safety law from the EU seems a daunting prospect. And while many may see Brexit as providing the chance to strip away unnecessary ‘red tape’, the impact on UK health and safety law is yet unknown. A recent report from EEF, the manufacturers’ organisation, and health and safety firm Arco, called for the current health and safety landscape to be maintained when the UK leaves the EU. Indeed, there have been questions raised over whether stripping back the UK’s legislation will do more harm than good. But for those concerned that Brexit will mean a dilution of health and safety law, it is worth remembering that the UK’s membership of the EU was preceded by the main health and safety statute in the UK – the Health and Safety at Work etc. Act 1974. And it’s likely that any changes to health and safety law will be slow. The second half of year saw Royal Assent for the Assaults on Emergency Workers (Offences) Act 2018, which has been welcomed. Chris Bryant MP, who laid the Private Members Bill, commented that “all too often attackers get away with little more than a slap on the wrist.” And according to reports, attacks on emergency workers – defined as including police officers, prison guards, NHS staff and firefighters – appear to be increasing. This law makes it a specific crime to commit a common assault, or battery, against an emergency worker “acting in the exercise of functions as such a worker”. It doubles the maximum sentence for assault against them from 6 to 12 months in prison. While some have questioned whether this law will make a difference, what is clear is that no emergency worker should be subject to abuse of any kind. There is no question that the legislation itself is positive, and for its impact to make a difference it needs to be followed up with proper enforcement action to make sure that those who attack emergency workers are brought to justice. So while the country awaits clarification on Brexit, it will be interesting to see how it impacts on the health and safety framework. In the meantime, ‘business as usual’ as the UK continues to uphold one of the strongest health and safety legislative frameworks in the world. To download this eBook and learn more, simply fill out the form opposite. By downloading this resource you understand that UBM and the Sponsor of this resource (where applicable) are providing you with this service, free of charge, with the explicit intent of identifying business leaders with a legitimate interest in UBM or the Sponsor products and services for which you will receive follow up communications. If you do not wish to continue receiving marketing communications from UBM or the Sponsor you will be able to unsubscribe using the links provided within the communications and you will receive no further marketing communications relating to this content. If you do not wish to receive any communications from UBM or the Sponsor please do not submit this form. I understand that I will receive follow up communications from UBM or the Sponsor downloading this resource.